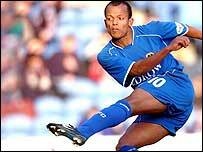 West Brom have completed the £3m signing of Cardiff City striker Rob Earnshaw on a three-year deal. The transfer, a club record for the Baggies, could rise to £3.62m depending on contractual incentives. The fee was agreed on Saturday after Earnshaw passed a medical, but talks over personal terms stalled prompting rumours of a late Everton swoop. But the Wales striker completed the move on Monday, ending a seven-year stay at Cardiff that brought 107 goals. The 23-year-old's international record has been even more impressive, yielding seven goals from 13 games, including a fine hat-trick against Scotland in February at the Millennium Stadium. Albion manager Gary Megson has been searching all summer for a proven goalscorer to bolster his side's chances of surviving in the Premiership and has now smashed the previous club record of £2.7m to sign Dane Martin Albrechtsen from FC Copenhagen. Earnshaw is expected to partner Kanu up front, given that Geoff Horsfield has struggled to convert his scoring opportunities in Albion's opening four games of the season. Earnshaw's move could smooth the way for West Brom midfielder Sean Gregan to head to Cardiff. After the Bluebirds' disappointing loss at Ninian Park to visitors Stoke on Saturday afternoon, manager Lennie Lawrence revealed that he had his sights on recruiting from the Hawthorns. "There is a possibility that one or two West Brom players will be coming to Cardiff, but if they do it will not be a part of the Earnshaw deal," Lawrence said. Earnshaw's arrival is welcomed by midfielder Andy Johnson, one of two fellow Wales stars - the other is Jason Koumas - at the Hawthorns. "He is better than (Tottenham and England striker) Jermaine Defoe in my book, he has great fitness and I don't know anybody who is as sharp as he is around the box," Johnson said. "He can score goals and will be a great signing for us, it will benefit him playing in the Premiership. "He will fit in very well at West Brom, and playing alongside people like Kanu will give him valuable experience." Academy: Ten fab Earnie facts!